Canon has just announced three intriguing cameras for videographers, unless you’re looking for 4K video, that is. Perhaps calling them intriguing is overstating it, because these cameras are in many ways similar to the Canon cameras already in the market. This means that you can expect the same Canon quality and a great selection of lenses. The only shortcoming is the lack of 4K, which stems from Canon’s business decision to offer 4K video with only their expensive cameras (the cinema line and the Canon 5D Mark IV). 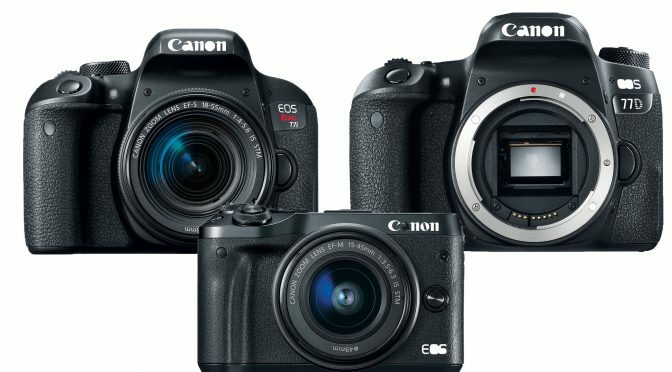 All these three new cameras have the same sensor and processor, namely the 24.2MP APS-C CMOS sensor with Dual Pixel CMOS AF and the DIGIC 7 image processor. Also, they record Full HD up to 60 fps. Hence, they offer very similar video quality (the only real difference being the maximum 35 Mbps for M5 versus the 60 Mbps video bit rate for 77D and T7i). As with all Canon DLSR and DSLMs, these new cameras use optical (i.e. in-lens) image stabilization. The M6, though, also includes electronic stabilization (what Canon calls Combination IS 5-axis). This type of stabilization isn’t quite as good as in-body (i.e. sensor-shifting) IS found in Sony cameras like the A7S II and upcoming a6500. Also, it means that if you use a lens without optical IS, you have no IS whatsoever. The M6, being a mirrorless camera, is the smallest of the bunch. It is actually surprisingly small – the body is just a bit bigger than the compact point-and-shoot Canon G7X. Another similarity to the G7X is the fact that the LCD in M6 tilts up, making it a great tool for vloggers. Another reason that vloggers are likely to love the M6 is that it has a 3.5mm microphone jack, allowing to record through an external microphone. So, the M6 appears to have all the characteristics that a vlogger would need, namely: external mic, lightweight, flip-up touchscreen, image stabilization and very good autofocus (the Dual Pixel CMOS AF); in addition, you get a camera with a large image sensor (APS-C) and interchangeable lenses. As of writing, the M6 appears to be the best option for vloggers. Canon is also releasing a new stock lens, the Canon EF-S 18-55mm f/4-5.6 IS STM, that eliminates up to four stops of camera shake. It’s also about 20% smaller than the 18-55mm F3.5-5.6 IS STM lens Canon currently sells, although you will lose a bit of speed with the new lens (1/3 of f-stop). You can get the new lens at BH Photo Video. So, to sum up, the M6 seems like a great choice for vloggers. For me, though, the most appealing camera is the T7i, because it is a budget camera with great video quality. In fact, the popular 80D (and its predecessor 70D) is probably no longer a good buy for videographers. The only big difference is the headphone jack on the 80D, and I would not pay that much more for that jack. Of course, things looks different from the perspective of photographers. But for videographers, they now have more budget and mid-price options among the Canon DSLR and DSLM cameras. so there is still place for the 80D, as it does have All-Intra .mov at 1080 30p…although the 60p on that doesn’t either. good points… but for the price of the T7i, can you get All-Intra? There are definitely cameras out there with better video specs. The Sony a6300, for example, gives great image quality for the money. Also, using IPB is not a problem. You can get great image quality with it, for example, 4K on the GH4 at 100Mbps. Plus, there are other things besides specs that make a camera great. Canon still does a lot of things right, even though their specs are not as good as the competition. For professionals, I would recommend looking at cameras from Sony and Panasonic, or the most expensive Canon models (if value for the money is not a priority). The big picture, though, is that for many years now video capabilities of DSLRs and DSLM cameras have been very good, even when it comes to budget models. More so than ever before, you don’t need to spend a lot on a camera to produce great work. When it comes to the M6, you get lower quality video than with the other two cameras, but it is still very good video – for sure good enough for vloggers, for whom I recommend this camera. but you make valid points. Thanks, Perry. I’ve found that the T7I image quality is great for the money, however, there is a lot of grading to be done in order to significantly improve it. I’d recommend this camera moreso for photography than filming.